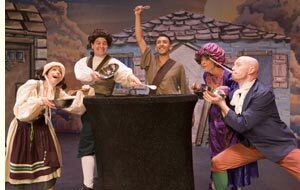 The story of Stone Soup begins with a poor, hungry traveler visiting a strange village. The man goes from door to door in search of food and shelter. At each place he is told the same thing "We have nothing for you. We barely have enough for ourselves. You cannot get something for nothing here, go away!" Being a clever fellow, the man gathers together a large iron pot then pours in a quantity of fresh clear water and three small round stones. The pot of water and stones is set upon a fire in the center of the town square. As he is tending his pot the farmer’s wife approaches and asks what he is doing. 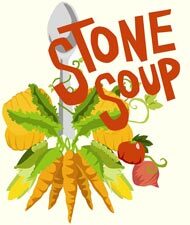 "Why, making stone soup of course! A most glorious meal, fit for a King!" The woman balks "stone soup? I have never heard of such a thing!" The man responds with incredulity, he replies that he cannot believe that she has never sampled the wonders of stone soup. She asks if she might have a taste and the man responds "Of course not! I barely have enough for myself and you cannot get something for nothing here!" The man then adds, "But of course the best stone soup is made with a bit of carrot but seeing as I have none I shall make do nonetheless". The farmer’s wife suddenly remembers where she may have tucked away a few carrots and hurries away and quickly returns with a large bunch of bright orange carrots. The traveler adds the carrots to the brew just as several other townspeople arrive at the pot to gawk. He remarks aloud that the stone soup, while still incredibly wonderful, might be better with a bit of meat and barley. They too wish to try stone soup, this glorious meal fit for kings. Each person adds items one by one to the soup and soon the square fills with an aroma more wonderful than any the town has ever experienced. The man finally announces that the soup is ready and torches are lit and tables are set in the square to accommodate the large number of people who have participated in the making of the soup. The meal is served and everyone feasts well into the night. In the evening, all full from the bounty they have shared; they do declare that stone soup is indeed a meal fit for kings. The traveler says he is weary and will curl up next to the fire for the night. The towns’ people insist that such a remarkable man must sleep in the home of the mayor in the most comfortable bed under the warmest blanket. The Mayor announces that this man of magic should be welcome in every home and the town will be forever grateful…for no one in the town will ever go hungry again because now they have been shown the miracle of how to make soup from stones!